By: Cho Hun-hyeon, trans. You Jungmin? 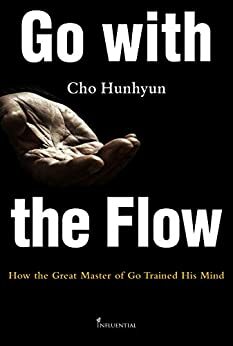 Go with the Flow - How the Great Master of Go Trained His Mind is a 2015 autobiography written by Korean, professional 9-dan Cho Hunhyun and translated by You Jungmin?. It features a collection of eight thematic stories and self-reflections about go and life. It has no game records. The original Korean edition was published in 2015 and the English edition as was published in 2018. The Korean edition can be found on the publisher's website here. The English edition can be found on Amazon here. "Since he became a professional Go player at the age of nine, he has won 1,935 matches and taken various championship titles as many as 160 times over 56 years, achieving unprecedented record in the world Go history. Now, he gives what he has learned through his life, the essence of how to train our heart and mind."